0 Comments Published by KL Ocs Kid on Sunday, June 6, 2010 at 7:17 PM. It looks like Steven Gerrard is going to have another World Cup ruined. No sooner had the Liverpool captain spoken of his distress at being tapped up by Chelsea four years ago in Germany, and two years before that at the European Championship in Portugal, than events at Anfield took a turn to defy all his best efforts to put club matters out of his mind and concentrate on England for the duration of the tournament. When Gerrard said last month he was going to shut himself off totally from events on Merseyside, and had told all his family and friends that he did not wish to discuss any "club stuff" until he returned from South Africa, he could hardly have imagined that might involve turning his back on conversations with Kenny Dalglish. It was a good plan, though not one that ever had much chance of standing up to developments such as José Mourinho taking over at Real Madrid or Dalglish being installed as kingmaker at Anfield. Not to mention Sven-Goran Eriksson coming out as a lifelong Liverpool fan. Gerrard found out four years ago how persuasive Mourinho could be, and that was when he only had Stamford Bridge to offer and not the glamour of the Bernabéu. 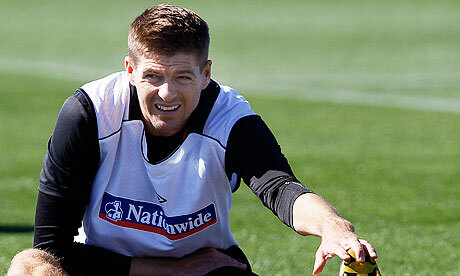 Gerrard came close to leaving Anfield in the early years of Rafa Benítez's reign, but eventually decided to stay. Now he probably wants to go, he would find one final chance to link up with Mourinho hard to resist, yet in Dalglish Liverpool have astutely appointed the one man to whom Gerrard has no option but to listen. Gerrard will have the best coach in the world in one ear this summer, offering him an escape route from the ongoing turmoil at Liverpool and the chance to end his career among the really big prizes instead of striving for little reward in the Europa League, and his lifelong friend, mentor and role model in the other urging him to stay. If Liverpool have asked Dalglish to identify their next manager, it is not because they needed someone with a phone number for Roy Hodgson or Martin O'Neill, it is because they know that Dalglish will act as a conduit for whatever Gerrard wants to happen. There is a school of thought that insists Liverpool would be better off selling Gerrard while they can – he has just turned 30 and will not always command a sizeable fee – though by bringing Dalglish into the process the club have done everything in their power to persuade their captain to stay on. For all his good intentions, it would hardly be surprising if Gerrard is once again a little distracted during the World Cup. Fabio Capello has just admitted the possibility of Dalglish turning up in person at England's training camp in the next few days, seeking permission to speak to Gerrard and Jamie Carragher. Christian Purslow, the Liverpool managing director, made a smart decision in bringing Dalglish onside, not least because such a populist move will keep complaint over the treatment of Benítez to a minumum. The problem for any incoming manager, however, whether it be Hodgson or O'Neill or one of the more ambitious targets such as Guus Hiddink or Louis van Gaal, is that the club remains in poor shape off the pitch. The owners are distant, in both senses of the word, and want to sell up. There are no buyers at the price they are demanding, plans for a new stadium have stalled and the future is unclear. The club may need to buy time with a temporary managerial appointment. Benítez has left Liverpool with three extremely good players, Fernando Torres, Javier Mascherano and Pepe Reina, who could either form the basis for a new team – should funds unexpectedly become available – or be sold on quickly for a tidy profit. There are rather more players who also need to be sold and will not yield a tidy profit, and with Carragher not getting any younger the defence is going to have to be rebuilt. Liverpool have not won a title in 20 years, Chelsea, Manchester United and Arsenal are all more secure at the top of the league and Manchester City awash with money, so this is not a particularly auspicious time for any manager to be taking over at Anfield. More or less the same thing could have been said in December 1959, the month Bill Shankly walked into Anfield, but those were different days. The maximum wage was still in operation, which meant that though Liverpool were in the Second Division they were able to rise extremely quickly under a well-organised manager who had spotted the club's potential to be the heartbeat of a great city. The maximum wage, for all its manifest unfairness, did at least have the redeeming feature of spreading talent fairly evenly throughout the top two divisions. With all clubs offering a broadly similar rate, players would happily countenance dropping down the table, or even dropping a division, as long as first-team football could be guaranteed. The opposite applies now, with top players gravitating inexorably to clubs in the Champions League bracket, even if they cannot always play every week. The new way to compete is to find owners with deep pockets, and Liverpool have been left behind in a race they should possibly never have entered in the first place. The city does football better than it does finance, and not for nothing does the most prominent anti-American protest group call itself Spirit of Shankly. Dalglish, as a graduate of the boot-room culture that produced every Liverpool manager between Shankly and Gérard Houllier, retains much of that spirit. Already there are calls for him to take the job himself, and resume his managerial career after 10 years away from the front line. Terry Venables thinks he should do it, Mark Lawrenson thinks he should do it. "I'd like to see Kenny – if not manager – at least involved in the set-up," the former Liverpool defender said. Bruce Grobbelaar agrees. "There is only one man for the job and that is Kenny Dalglish," the goalkeeper said. "He's respected, he'll be a stabilising influence and if he didn't have the appetite for the game he wouldn't be at Anfield every week." As Houllier once complained, the list of ex-Liverpool players with media platforms to express their opinions is extensive, and it is no surprise to find them backing Dalglish because to a man they would all be in favour of Liverpool returning to the pattern Shankly established and promoting from within. That may be an unrealistic hope, and there is no indication at the moment that Liverpool intend to turn the clock back with Dalglish, yet to an extent they already have and if the Scot's mission is to get Gerrard to stay he will need to promise him more than Hodgson and a limited transfer budget. The opinion that matters most about what happens next at Liverpool belongs to someone who is not an ex-player yet, someone who is vainly trying to shut out the siren calls from Merseyside in his hotel room in South Africa. A fortnight ago Gerrard was hoping to get away with a quiet World Cup. Fat chance. Not only is he now the England captain, he faces a choice between the Bernabéu and the boot room.